This week we began looking at Macedonian civilization, and as usual we began with geography. The map shows Macedon as a land-locked and mountainous area, and we would expect this kind of terrain to have a particular emphasis on its people. . .
Usually an aristocratic warrior elite seeps into the culture, which usually divides the people into warring clans (for this and the above point, think of Afghanistan, which has a similar geography to Macedon). With this environment, we usually see a low level of cultural output, due to their relative isolation and internal divisions (this is not the case with Scotland, but Scotland is not land-locked as Macedon is). I was glad to see the students start to make connections between Macedon, Assyria, and Sparta. All three share a similar geography, and all three share a similar geographic position — on the periphery of their respective societies. Sparta and Assyria had stronger central governments than Macedon, but their similarities should make us realize of the power of geography to shape the course of a civilization. As I mentioned, Macedon had little role in Greek civilization for many centuries. But as luck would have it, Macedon saw the rise of the charismatic and ruthless Phillip II just at the very moment of grave political weakness for Athens, Thebes, and Sparta. Opportunity knocked for Macedon. Phillip looked every inch the tough customer he portrayed, wearing an eye patch over his wounded eye for necessity, and probably, for effect as well. But Phillip combined his personality and appearance with a keen understanding of how to maximize the qualities of his society into a formidable military machine. In addition to the long spears you see above, their soldiers also carried a long dagger, another offensive weapon. 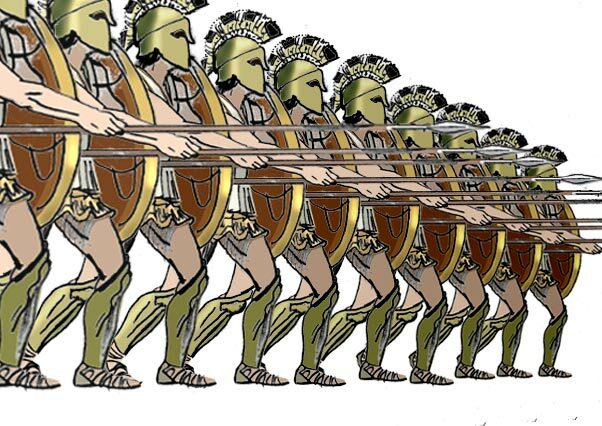 While the image above does show the Macedonians with shields, I agree with Victor Davis Hanson (and others) that argue that Macedonian shields had no real function in battle. They were worn apparently mostly around the neck and draped to the side (as both arms would be needed to wield their spears). Some argue that the shields were used in battle, but mainly as a prop for their spears. If this is so, we see that even their shield served as a offensive weapon of sorts. Phillip’s infantry gave them much more firepower at the point of attack. Not only did they have longer spears, but because they had to stand sideways to hold the spears, they could fit more men in each row. 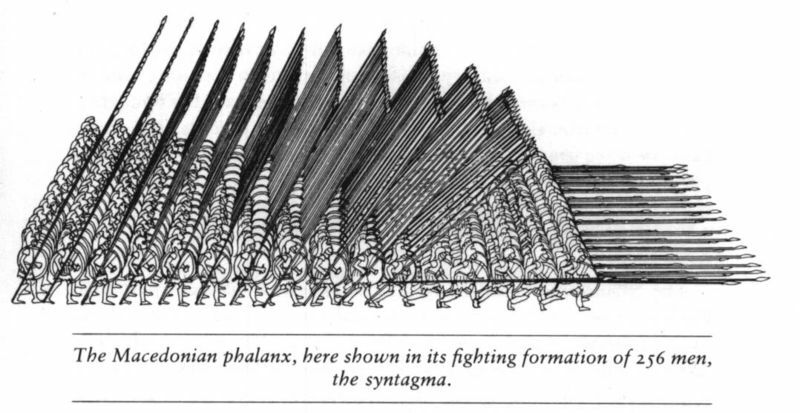 Some students wisely pointed out that the Macedonians would be vulnerable to a quick flanking movement, but the Greek infantry Phillip faced was “heavier” infantry, and not equipped for fast movement. They could not exploit this weakness of Phillip’s force (though a century later, the Romans would do so). I hope that the students understood that militaries don’t, or at least should not, be created in a vacuum. They function best when they are a direct product of the civilization from which they arise. 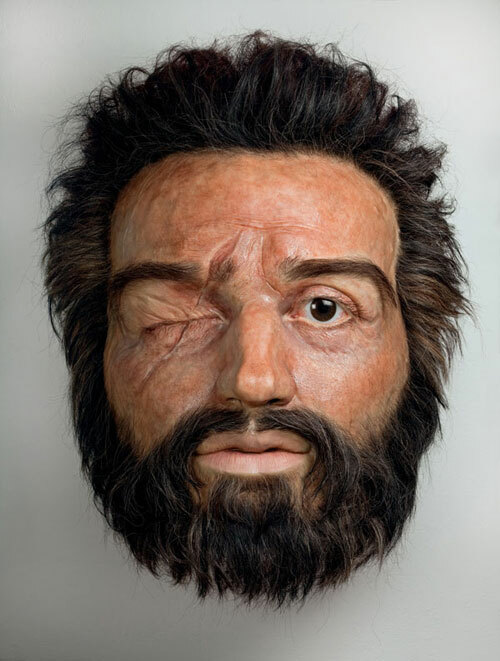 Next week we will continue by looking at the most famous Macedonian of all, Phillip’s son Alexander. This entry was posted in 8th Grade, Weekend Updates.